As I began to watch "The Humbling," the brand new movie starring Al Pacino, I was amazed by how much it reminded me of "Birdman." I mean, its a movie about two-out-and-coming-actors. As the film begins, Al Pacino is talking to himself in the mirror, much like Michael Keaton's character. In the same scene, Pacino is late for a play he is doing, much like Keaton's character. Both films also have to do with suicide. I was amazed by the brief but clear parallels to both movies. Alas, "The Humbling" being "Birdman Redux" is something nobody needs to worry about. "The Humbling" begins ascension down a weird rode, much like "Birdman," but with a lot less entertainment and curiosity. As much as I have liked Al Pacino in the past, I have no idea what he was thinking signing up for something like this. What "The Humbling" basically boils down to is Simon Axler (Pacino) playing a suicidal actor, and one of the things that quasi-helps him is an affair he has with friends daughter (played by Greta Gerwig). The affair eventually doesn't help, and soon enough, Simon Axler can't figure out what is real and what is not. So not only does the film rip-off "Birdman" in several scenes, but it etches in an unneeded and inappropriate affair story that eventually goes nowhere. What is the most aggravating about "The Humbling" is that it doesn't feel like a movie at all. I can't call "The Humbling" a comedy, because none of it is funny. I never laughed once, and there was never a time where I really cracked a smile. 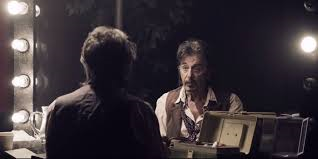 I can't call "The Humbling" a horror movie because its not scary, although I did want to scream when I saw both Pacino and Gerwig lost in such a crappy screenplay. "The Humbling" isn't an action movie because there is no action in it. I think the film could have made an engaging character study about how people get lonely and how mental illnesses begin to tear their worlds apart, and how these damaged people find subtle happiness in the strangest of places. The problem is, "The Humbling" never devotes itself to figuring those ideas out. It never brings any intelligent thoughts to the table at all. There is not one moment in this movie where "The Humbling" feels like a movie, just random scenes cobbled together for the sake of it. I can tell that Al Pacino really wants this one to count and you can tell he is as committed to this role as he is with his entire filmography. It is just not enough to make me care, I need more than one person carrying the weight of a bad movie. Pacino gets minor help from Gerwig, who is also trying to make this movie count. I will say that I was impressed how de-glamorized Gerwig was in this movie, and how she was still able to look beautiful in her own way. But she plays a non-character, so it gets hard to care about her. There is some supporting work done by Kyra Sedgwick, Dylan Baker and Dianne Wiest, but none of it really matters because they feel like they are barely in the movie. All this movie really does is sulk with Pacino's character and Pacino isn't given enough to make his character soar. Something like "The Humbling" really confuses me. I never really understood what it was about, and I never could pick up on the emotions and feelings director Barry Levinson wanted me to get. I am baffled Pacino and Gerwig and all the other obviously talented people in this decided to act in it. There isn't anything here I was particularly fond of, and I just hate saying that about a movie.